REPREVE is a brand of recycled fiber that is made from recycled materials, including used plastic bottles. Because it offsets the need to use new resources, such as petroleum, and emits fewer greenhouse gases, REPREVE helps provide a reprieve for the planet. As a leader in transforming recycled bottles into a quality textile fiber, REPREVE makes its partner’s brands more sustainable. Since 2012, Ford Motor Company has worked with Unifi to bring environmentally responsible, high-performance REPREVE fiber to many Ford vehicles. Now, this innovative fiber is available in the all-new F-150. By substituting with this recycled material, Ford will divert more than five million plastic bottles from landfills this year. Ford is the only automaker to use REPREVE, made from 100 percent recycled materials including plastic bottles, in its vehicles. Ford is currently using REPREVE in five vehicles around the world, making it a truly global material, and it represents Ford’s larger commitment to reduce, reuse and recycle as part of the company’s global sustainability strategy to lessen its environmental footprint. Ford was just named ‘Best Global Green Brand’ as they have found ways to cut waste and use recycled resources. One of the most important material is Repreve fabric. The partnership with Repreve has brought Ford lots of reputation. 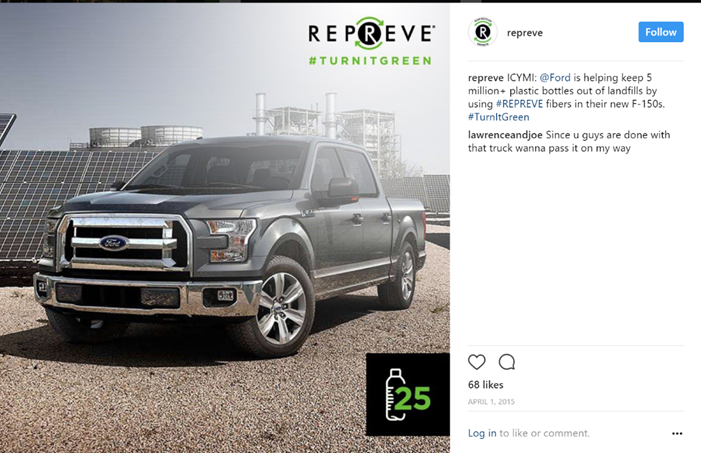 One of the biggest benefits for Repreve fabric to cooperate with Ford is Ford is one of best-selling vehicle company in the world such as F-150 is the best-selling truck in America, and as orders are plentiful, more and more plastic bottles are, and will continue to be, taken out of landfills across the nation. According to the Ford, more than five million plastic bottles will be taken from landfills this year alone to fulfill orders for Ford F-150 seats. Five million plastic bottles. The cooperation makes Repreve a truly global material. Repreve never miss the opportunities to advertise themselves with Ford together on their social media. It is very interesting to let the consumer know every Ford vehicle they buy, they will save only 25 plastic bottles. It might not be a big difference to the consumers. But it is an important point to let the consumers know the Ford brand is trying to save the environment and is a Green Brand. Also, the consumers might not know or never pay attention to the Repreve recycle fabric, but the cooperation with Ford and advertise themselves with Ford is a good way to branding. 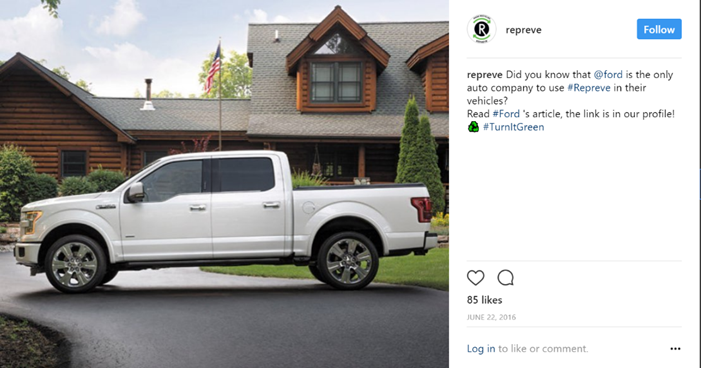 Ford’s social media manager has post lots of content about their partnership with Repreve at Ford Blog. In my opinion, the target audience should be the consumers who wants to buy cars. The content on their Blog focuses on the ‘green seats’. Initially it sounds a little ridiculous. Why would someone want more plastic in their truck? The content explains that it’s actually quite innovative because Ford has partnered the manufacturer Unifi, which takes recycled plastic, including used bottles, and turns turns them into thread. The material is called Repreve, and it’s also found in products made by The North Face, Quicksilver and other quality clothing brands. The content shows the consumers why the Ford vehicles are more environmental friendly and where is the environmental friendly part. And also advertise for Repreve. 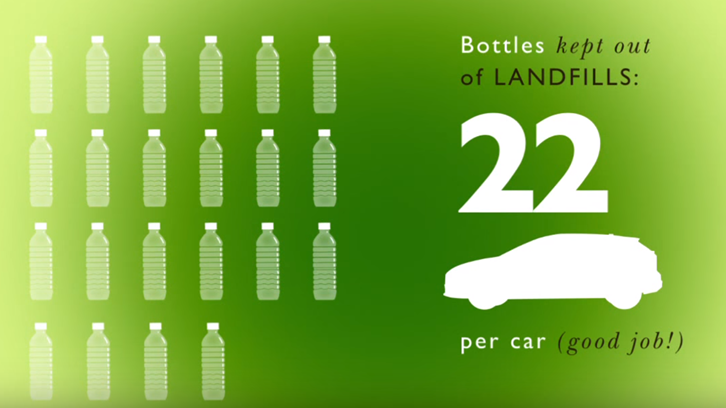 Each Ford vehicle will keep 20~25 bottles out of landfills now and the cooperation of Ford and Repreve will save about 5 million bottles each year. Consumers always like the environmental-friendly products, so both companies are trying to advertise their “effort to be sustainable” together which expand the visibility of both companies.